Please refer to our stock # BE2121 when inquiring. 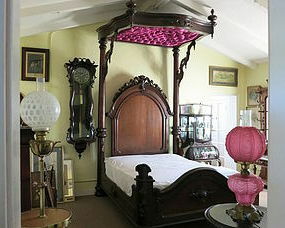 The best Victorian bed we've ever had or seen, this half tester American bed, circa 1860, is absolutely beautiful. It measures 10 feet tall, 83 inches long and 68 inches wide. It takes a queen size mattress. Its in all original condition with the exception of the top having been recovered. Probably made in New York by Prudent Mallard.